Jane Lipman's first full-length poetry collection, On the Back Porch of the Moon was published by Black Swan Editions in 2012. 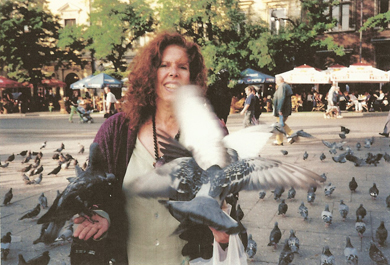 Jane's chapbooks, The Rapture of Tulips and White Crow’s Secret Life, published by Pudding House Publications in 2009, were finalists for New Mexico Book Awards in Poetry in 2009 and 2010 respectively. She was awarded first prize in poetry in the Santa Fe Reporter's Writing Contest, 2001. Her poems have appeared widely in journals and anthologies, including: Adobe Walls, Echoes, Lummox, Malpais Review, Modern Haiku, New Mexico Poetry Review, Runes, Sante Fe Literary Review, Sin Fronteras/Writers Without Borders, small canyon anthologies 2,3,4,5,6, and 7. During the 80’s, she founded and directed Taos Institute, which sponsored performances and workshops by Robert Bly, Gioia Timpanelli, Joseph Campbell, and others. She has lived in northern New Mexico since 1970. All content copyright protected. © 2009-2013, Jane Lipman. All rights reserved.